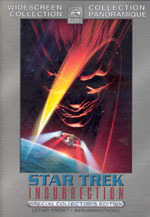 Going into this film, it was well established amongst fans that odd-numbered Star Trek movies were generally not as great as their even-numbered counterparts. Would this film follow the same pattern and be disappointing? I was pleasantly surprised to feel that "Insurrection" had finally smashed the odd-numbered myth forever, and Jonathan Frakes had struck gold yet again by directing another great film for the franchise. Mind you, I never quite subscribed to the odd/even numbered theories very strictly, since I do think that number 3 - The Search for Spock is pretty much on par with its neighbours in the sequence of films, and I do like all the films in their own way. But number 9 here, "Insurrection", is a particular favourite, capable of outranking many of the even-numbered films. Is it better than the previous film, "First Contact"? That was a question without an easy answer, requiring comparison of many aspects of each film. Perhaps one of the best reasons for ranking this film higher than its predecessor is that you don't have to be in the mood to stomach horror and face your fears in order to enjoy it in the same way that the previous film required you to. You can come to this one in just about any mood you want. Perhaps we have our star and associate producer Patrick Stewart to thank for this story pathway, because he reportedly steered the creative team away from repeating the theme of darkness that had hung over the three previous films. Nice move; we didn't need the re-run as much as the change of tone. Besides, a society of high philosophy should produce good dramas of lighter tone equally if not more often. "Insurrection" manages to deliver a gripping one here. Good job. Of all of the feature films, this one tackles the Prime Directive head on as part of its main plot, which is one of the things I totally love about this film. If anything, I wish they'd gone further with it. Early on, the Next Generation crew is seen to get on the correct and heroic side of the issue, and are prepared to take on those higher up in their command structure over it. I was very keen for the upcoming insurrection to occur over this and topple the Prime Directive once and for all within the Federation. The scene where the Ba'ku reveal their technological know-how and social equality diffused the jurisdiction of pre-contact protocols instead of challenging them, and I was a bit disappointed that the story took that direction. But it still delivered excellence in many other ways. "Your Directive apparently doesn't include spying on other cultures." Early on, we repeat the imagery of the duckblind from the Prime Directive tour-de-force third season TNG episode "Who Watches the Watchers", and take that imagery to new heights with invisibility suits. Nicely, Data gets a great entrance ripping down all of that deception and secrecy, substituting a truth that will have to be dealt with during the drama of the rest of the film. Excellent start. Before long, we also see a repeat of an idea from another key Prime Directive TV episode, this time the seventh season's "Homeward" and its use of a flying holodeck to transport pre-contact civilizations to a new planet without them realizing that they've gone anywhere. Perhaps the imagery associated with this idea is a bit more obscure and more altered from its TV counterpart, delivering some spectacular visuals and plot dynamics. Whether or not part of this film's plan was to reconstruct the Ba'ku village identically on their destination planet is a point never really explored here, and hadn't been necessary in "Homeward". If this movie is inferior to its predecessor, it is in being less polished in its choices of what parts of the story to feature on screen from the writing standpoint, and how much time, emphasis, and dramatic power to put on each scene from a directing standpoint. The extras seem to reveal that the crew is aware of these things while making the film, yet not using their awareness to bring things up that extra notch. Weird. Many early scenes are worthwhile in the long run due to nice payoffs later on in the film, and become more palatable on repeat viewing when you know where these nuances are going. But encountering them for the first time, one is forced to wonder why the camera is choosing to show these things to us, and it mistakenly feels like the film has a lack of focus. For example, Picard later comments on how desirable the Ba'ku's slower pace of life is, which the audience easily believes, thanks to the hectic, over-scheduled nature of the activities we see the Enterprise crew involved with in the opening scenes. But those activities appear to have no importance to the movie when we first see them. The conversation with the blue-skinned Bolian that gets aborted before going anywhere is a prime example. If we have to wait 40 minutes to get a clue as to why a moment like this has been scripted, it should be re-written as something that can stand on its own while its greater purpose comes along later to add depth to it. Many more examples of this are apparent. Having two conversations going at once during Worf's first appearance takes away from the sense that the movie knows what it's doing and where it's going. There are perhaps a bit too many references to the various territorial conflicts that Deep Space Nine was heavily occupied with, while the explanation for Worf's presence is unintelligibly cast-off into the corner of the room. Some of the shifts in tone as various people decide to play or stop playing different pieces of music also seem to lack a certain finesse. Sadly the Next Generation crew are quick to leap into song as well, with the jarring tone of "A British Tar" grating badly against the usual tastes of their science fiction audience. Yes, this pays off with some great humorous moments both with Worf in the moment and with Data later on, but this doesn't seem to be enough to justify the length of the singing that appears on screen. It's all about knowing where your excellence is, and putting your emphasis on the right things. Still, I think the singing here is far better motivated than what we get in the next film, where the payoff is without humour and only serves to prove that too many film writers are trying to copy the temporary we-didn't-really-mean-it type of death that Star Trek II pioneered. Ho hum. The action beats on the planet work nicely, giving the film a great energy and probably the most outstanding scenery of any Star Trek film yet. However, once the gang make it to the caves, the film has a hard time creating anticipation that the plot will advance anywhere interesting. This is partly because Picard and company have pretty much achieved the objective of their trek and aren't sure where they are going next, partly because the cave interior scenery reminds one of so many TV episodes where plots stalled in caves to pad out screen time and it appears that the same is happening here, and partly because the fantastic plot twists that eventually do come all spring from Picard and Anij getting captured instead of doing anything proactive on their own. Better would have been some kind of discovery made in the caves that could lead or motivate Picard and Anij to get up to the Son'a ship by their own design. But in the end, these are all minor nits, most of which vanish during subsequent viewings of the film when you already have an idea of all the excellent twists and beats that the characters get to go through. 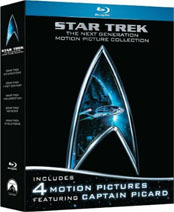 This is undoubtedly the most humorous and fun of the Next Generation crew's feature films, and also the most romantic, with the playful rekindling of Riker and Troi's relationship making far better viewing than their mournful wedding in the next picture, and with tasteful sparks flying between Picard and Anij as well. Also very enjoyable are the debates between Patrick Stewart and Anthony Zerbe, which allow Stewart to take one of the strongest attributes of his character from the TV show and display it proudly on the big screen. This is what put Picard ahead of Kirk in my list of favourite Star Trek captains, and it is done better justice here in this feature film than in any of the others. Visually, this is quite an exquisite film, from the natural location, to the location enhanced by Herman Zimmerman's constructed village, to the beautifully unique outer space vistas of the cloudy reddish "Briar Patch" and its ringed planets. We get our share of space battles in this story, which seem a bit wordy like the television show, but the visuals this time around help keep these manoeuvres looking unique and, quite frankly, as gorgeous as the rest of the picture. Nice. And when all is said and done, I think this film stands on its own better than the previous one. "First Contact" feels more like part of an essential bigger franchise. "Insurrection" is a great film that also happens to belong to a great franchise. In terms of final climactic actions, Picard is once more clearly the main character of this tale, and gets the primary focus and spotlight as he should. Interestingly, he goes off on his own tangent several times in the film, only to discover that the rest of his crew are loyally ready to follow and support his every move. Nice. Once again, most of the men get to provide a critical assist, while Troi and Crusher get forgotten, and the movie has so many last minute turns that the ending can easily remain fresh and surprising on subsequent viewings. And Picard gets the most important final moves perhaps better here than in any of the other features. Sadly, Ruafo's final fate seems much more interesting in the alternate ending, and the choice of the official ending for the film seems to have only been satisfying misguided bloodthirsty tendencies amongst the studio and the crew. Jerry Goldsmith is back to give us another tour-de-force of inspiring new musical compositions to enhance this film. Once more we get favourites like the Next Generation's anthem from Star Trek: The Motion Picture, heroic variations of the four-note Sybok motif, and the Klingon theme for Worf. Excellent new stuff includes beautiful graceful melodies like "Ba'ku Village" and "New Sight", while bizarre synthetic trickling effects combine with unusual 7/8 piano rhythms to give us some great action cues. Superb stuff, on par with but not quite outdoing the excellence of his "First Contact" score. In the end, this is an excellent film. Rather than try and declare it either better or worse than the previous film, I think it wiser to say that it is in the same league, and more appropriate for a lighter, more romantic, more thoughtful viewing experience. This is a fine piece of Star Trek. Enjoy! Read the next Star Trek review: "Star Trek 10: Nemesis"
Star Trek 9 is available in various incarnations on DVD and Blu-Ray. Audio commentary by director Jonathan Frakes (William Riker) and Marina Sirtis (Deanna Troi).